SS Rajamouli, the star director of the Telugu film industry is currently very much busy shooting for his new movie RRR. Jr NTR and Ram Charan are playing the lead roles in the film. The shoot for the first schedule already began and the makers are pretty much excited with the way it is shaping up. On the other side, Rajamouli is shifting his focus on to the arrangements of his son's wedding that was arranged with Pooja Prasad, the daughter of hero Jagapathi Babu's brother Ram Prasad. The engagement ceremony took place sometime back in Hyderabad in a grand manner and the wedding is going to take place n 30th of this month in a much more grand manner. 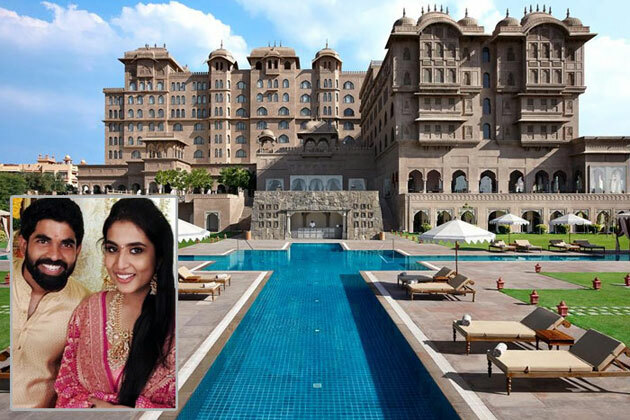 Apparently, it is going to be a destination wedding and the director booked a 7-star-hotel in Jaipur of Rajasthan as the wedding venue. The hotel is named, Hotel Fairmont and it is a 250-acre property built like a Mughal palace. A lot of Bollywood movies were shot in this palace and Rajamouli lived upto the expectations by booking a 'Baahubali'an venue for the big-fat wedding.